In most general terms this question can be answered like this: cactus is a plant of the family Cactaceae. But in order to fill this definition with meaning we need to know what the family and Cactaceae is. Speaking figuratively, the botanical family resembles the human family very much in the aspect of consanguinty. Both for humans and plants this word means a group of representatives having common origin and family features. Though common family features of cacti are quiet diffucult to establish, as there’s is an inexhaustible variety within this vast family that comprises about three thousand members. There are giant cacti with the height of 18-20 metres. 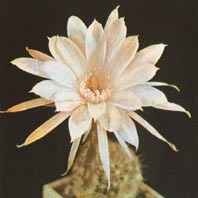 There are dwarf cacti that are 3 cm wide and 1,5 cm long. It is not only dimensions that can be different but also the stem form, the structure and coloration of flowers, conditions and pace of growth. Let’s have a look. In Argentine hyleas we can see a tall slender tree shaking its crown proudly with bunches of fine fragrant rose between its large bright leaves. It’s Perescia. 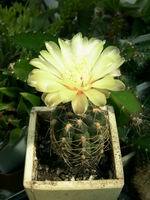 Perescia is a cacti variety that can be identified because of its spiny stems and abundant leaves. Because of these attributes, perescia flowers are often mistaken for wild roses. In a thicket of tropical woods of Brazil a strange plant hangs down from trees like green dishevelled locks. It’s Ripsalis, an epiphytic cactus. Among stones of the Texas desert we can see a low impassable thricket of prickly warm grey Echinocereus spangled with large ruby flowers. Powerful ridge columns of gigantic Carnegia rise in foothills of Arizona. A small knobby ball of Mamilaria hides in grasses of the Mexican savanna. Its long hooked thorns grow from every knob of its green stem, belted by a wreath of tiny tender flowers. Let’s consider these terms in more detail. 1. Perennial succulent. Well, the first word hardly needs a thorough explanation – who doesn’t know that a plant which lives more than two years is called succulent? 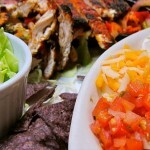 And succulent is used to name those plants that reserve moisture in their tissues that helps them to endure drought. That’s it. But mind that the words “cactus” and “succulent” are not absolute synonyms. Remember, any cactus is a succulent but not vice versa: succulents are not limited to cacti and include other plants. Among other succulents plants are those that belong to such botanical families as euphorbiums, crassuls, liliaceous, etc. 2. There tons of books about the dicotyledons, but what’s important for us is just their two typical features: first, seeds of these plants and their shoots have two cotyledons, second, the cambium of the dicotyledons (the layer of the most active cell fission that makes the diameter of the stem increase) is like a well-formed closed ring. Such a cambium ring makes it possible to inoculate one cactus with another, for example, a well-growing with a poor-growing one. 3. 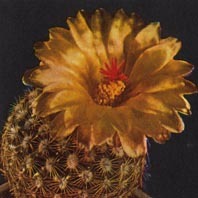 The areola, this interesting organ that every cactus has on its stem, is all cacti’s specific feature. If you know what the areola is it’s never a problem for you to distinguish between cactuses and other succulents. If we compare cactuses with deciduous plants, it is possible to say that the areola corresponds to the shoot and the axillary bud, i.e. it’s in fact two organs in one. The inferior part of the areola produces new buds, while the inferior part produces thorns that can be quite easily separated from the stem: the cactus thorn is an independent organ but not an offshoot of the epidermis. 4. 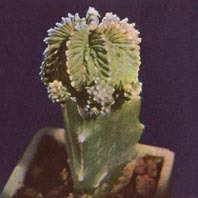 Inferior ovary is also typical of cactuses. Inferior ovary of the cactus from which the fruit is formed is located below its petals. Wild strawberry which fruit develops above its petals is a vivid example of the plant with superior ovary. 5. Cactuses have berry-like fruits. 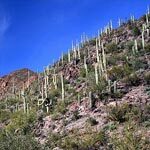 Cactus fruits, whether they are as large as a plum or as small as a currant, are all typical berries: their fine seeds are embedded in the pulp covered with the skin. The size of these berries, their coloration, juiciness, taste, and skin surface vary greatly depending on different cacti. The listed and described five features taken together generally characterize the plants that belong to the family Cactaceae, i.e. cactuses. 3 Responses to What’s Cactus?